> Medicinal Mushrooms>Turkey Tails>Dried Turkey Tail 2 oz. Turkey tail mushroom is a common polypore bracket fungi that is easy to recognize. In Asia, turkey tail is a highly regarded medicinal herb. In China, it is called Yun Zhi, and in Japan, Kawaratake—“cloud mushroom,” and goes by the scientific name (Coriolus versicolor). 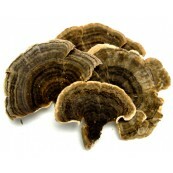 Turkey tail mushroom, like other medicinal mushrooms, has long been esteemed in traditional Chinese medicine. This natural mushroom is believed to have healing elements to strengthen the body against illness and disease. The easiest to access the medicine of turkey tails is by boiling. The recipe, known as Turkey Tail Tea, is easy – just throw a handfull of Turkey Tail mushrooms into a crock pot and let simmer for 48-72 hours. After that point the good medicines are released. Just get a cup and drink! Krestin (PSK), a proprietary anticancer drug approved in Japan, is extracted from the Turkey Tail mushroom and accounted for 25.2% of the total Japanese national expenditure for anticancer agents. Nakazato et al. (1994), reported that 262 gastric cancer patients treated with PSK as an adjunct to chemotherapy showed a decrease in cancer reoccurrence and a significant increase in disease-free survival rate. Kobayashi et al. (1995) reported that the protein-bound polysaccharide PSK reduced cancer metastasis. Sakagami et al. (1993) reported that PSK stimluted interleukin-1 and interferon production in human cells. Other researchers have reported that PSK appears to be a scavenger of free-radical oxidizing compounds. Unlike many conventional anticancer drugs, PSK produces few, if any, side effects and shows no immunosuppressive activity. PSP, a water soluble, low-cytotoxic polysaccharidepeptide appears to induce cytokine production and T-cell proliferation. Collins and Ng (1997) based on an in vitro study proposed the use of PSP as an antiviral agent for the inhibition of HIV replication. In a controlled clinical trial of 485 cancer patients (211 control patients) with cancers of the esophagus, stomach and spleen; treatment with PSP in combination with radio- and chemo-therapies was investigated. In the PSP group, the side effects from the conventional therapies (pain, poor apetite, fatigue, weakness, dryness of throat and mouth) was significantly lessened and body weight, T-cell ratios, NK cell activity and IL-2 levels were significantly increased. PSP also raised the one year survival rate of esophageal cancer patients by 11% and significantly increased remission rates when compared with conventional chemotherapy treatments. The medicinally active components of Turkey Tail are considered to be biological response modifiers which induce immune responses including the increased production of gamma interferon, interleukin-2 and T-cells. The Latin name is Trametes versicolor, which means thin (trametes) and many colored (versicolor). In Chinese medicine it is referred to as yun zhi, and the Japanese name is kawaratake. The turkey tail is a polypore mushroom, meaning they release spores through many small holes underneath their caps. Many medicinal mushrooms are polypores. Like so many polypores, these mushrooms are also bracket fungi. They produce fruiting bodies that are shaped like shelves or brackets. These brackets are grouped closely together either horizontally or one on top of another. They are saprotrophs, which means they feed on decaying matter of other living things. This is why you always find them on old, rotting logs. To spot a turkey tail, it's best to look down. You'll usually find them on decaying hardwood or at the base of trees. 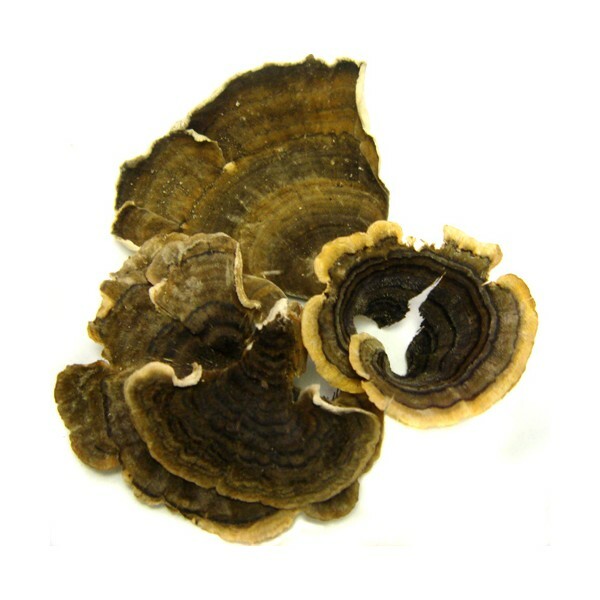 For other identifying characteristics, know that they have no stem, groups of thin caps with concentric zones of varying colors, and a spore print that ranges from whitish to yellowish. You probably don't need to go far to find one of these multi-colored mushrooms. They're found in forests all over the world from Europe to Asia to the US and Russia. Many people think that the Coriolus versicolor mushroom is a different species. It's not! 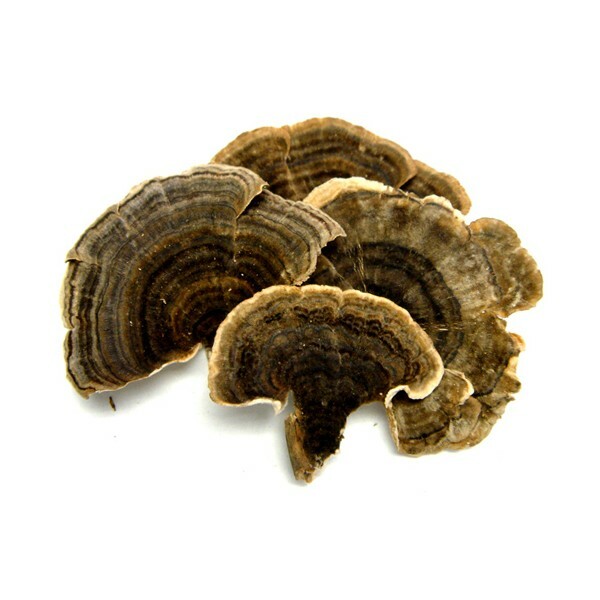 Coriolus versicolor is just another name for the same turkey tail. Turkey tails are edible, but as they're also very tough and leathery, most people consume them by making a tea. This is a mushroom for all seasons! They're common from spring until fall, and you can sometimes even find them in the winter. Disclaimer: The information provided within this site is intended for information purposes only and is not intended as a substitute for advice from a physician or other health care professional and should not be used for the diagnosis or treatment of any health problem or for prescription of any medication or other treatment. Taking natural products should be a decision based upon personal research and the advice of health care professionals and be based upon a thorough understanding of the role food-derived medicinally-active compounds play in health and wellbeing. A health care professional should be consulted before taking any medication, or if you have or suspect you might have a health problem. Do not discontinue any other medical treatments without first consulting your doctor. It is very important that dried mushrooms are stored properly to insure long term and maximum freshness. Turkey tail mushroom generally stays potent for many years, regardless of its form. The constituents don't break down easily. Place the mushrooms into either a plastic or glass container with a tight fitting lid and keep it away from heat and light to extend its useful shelf life. Our first recommendation, though, is freezing or storing in a refrigerator or freezer. Place the dried mushrooms in a clean, tight sealing freezer bag. The reason for maximum cold storage is because heat and moisture are the greatest enemies. The mushrooms should keep well for six months to a year.